Sturgeons are truly unique creatures believed to be on earth in their present form for the last 200 million years, the end of the Triassic period, ranking them among the most ancient animals to inhabit earth. There are 25 different species of sturgeons around the globe from China to Russia, Europe and North America. North America is home to the species “White Sturgeon” which also happens to be the only sturgeon species listed LC (least concern), whereas all other species are either listed as “critically endangered”, “endangered”, “threatened” or “vulnerable”. The white sturgeon is North America’s largest fresh water fish that can reach an age of over 150 years and weigh as much as 816 kg (1,700 lb) and reach a size of 6.1 m (20 ft.) The largest sturgeon ever caught on record weighed 498.9 kg (1,100 lb.) and measured 3.76 (12 ft. 4 inches). An important reason why the white sturgeon is doing so well here is British Columbia is because sturgeon fishing is big business. Annually thousands of anglers from around the world and across Canada come to British Columbia to pursue this prehistoric river monster. Anglers going for a sturgeon must use barbless hooks that do not harm the animal and it must be released again. 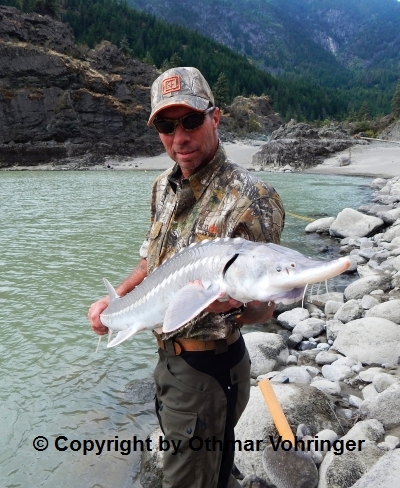 Sturgeon anglers also must obtain a special sturgeon conservation licence costing eight dollars per day for British Columbians and 15 dollars per day for all non-residents. That got me to thinking that as an angler and a hunter I probably owed it to myself to at least try sturgeon fishing once in my lifetime and began to give some serious consideration and planning on catching a BC river monster. It just so happened that I knew somebody to ask for advice on sturgeon fishing and he was most helpful and even offered to assist me on the trip. Originally I set the sturgeon fishing date to coincide with the annual sturgeon fishing derby held in Lillooet, but a change in work schedule nullified that idea, which turned out to be a very good thing. I rescheduled the fishing trip for the last weekend of August; that way I could share this unique experience with my brother who was visiting us from Switzerland and with my wife. On Sunday, August 31st, we met my sturgeon expert friend and followed him to his secret sturgeon fishing place. The weather was mixed with light rain and sun periods, just perfect for some good fishing, although at times heavy winds made it difficult to cast far enough out into the deep water of the mighty Fraser River, where big sturgeons swim. After several hours of watching for the tell-tale twitch on the rod tip it finally happened: “Fish on! !” My sturgeon expert friend Clay hooked the fish and asked “Who wants to real the beast in?” We quickly decided that this honour should belong to the guest and so my brother had the task of getting the sturgeon on land and have the pictures taken. 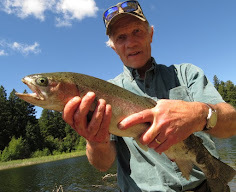 It was not a big fish by any means, maybe 4ft at most, but it was the first BC river monster that I ever have seen close-up and touched with my own hands. I am thankful for everything Clay did in assisting us on the trip with his advice and tips. It was for sure one of the best outdoor experiences I had in many years and best of all I was able to share it with my wife Heidi and my brother Roland and it doesn’t get any better than that.